You are playing Knack in your living room on your PS4. Your parents walk in an decide they want to have some grown up time, and decide to watch the season finale of Dexter. So you walk to your bedroom, turn on your Vita TV and stream the games to the TV in there. After a short while your parents tell you that the family is going out for dinner, and you have to come. You make sure to bring your Vita with you as you leave. After a delicious meal, everyone has there phones out catching up on what they missed. You pull out your Vita and decide to take the time as an opportunity to complete the level of Knack you didn't get to finish at home. You connect to the restaurants Wi-Fi, and power up the PS4 app on your Vita. You use the remote play feature to play your PS4 on your Vita by streaming the PS4 to the Vita. You complete the level just before your parents finish paying the bill, and you leave without worrying that your friend beat the mission before you. This is an example of the experience that the circle of PlayStation devices can provide you. With the new PS4 on the horizon, Sony was able to have an opportunity and start over to create the perfect connected gaming experience. The PS3 was never fully optimized to take on the Vita's remote play function, where only very few games worked and it lacked innovation from the PSP's remote play. It is almost a rule to have your more powerful machine work around the limits of your weaker device. This is to insure that your weaker handheld isn't trying to play catch-up with its superiors performance, and that certain hardware can be implemented to make the feature work. Sony has had the chance to test the Vita's compatibility with the PS4, where with the PS3 they couldn't. Optimizing and including certain hardware is what will run the Vita to PS4's remote play. Since the PS3 had most likely already launched before the Vita's development, Sony never had that option to optimize the PS3's hardware. 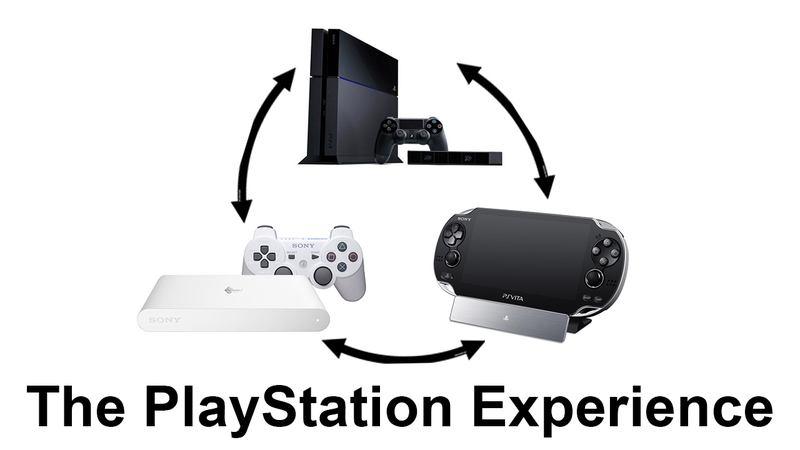 The step from the PS3 and Vita's remote play, to the PS4 and Vita's remote play is substantial, and is a game changer. No longer does your Vita need to be connected to the same Wi-Fi as your console, but now with the PS4 you can be anywhere in the world, provided you have an internet connection, and still be able to play your games sitting at home. Sony is featuring more than two PlayStation devices this generation though, and Sony is furthering the the bond between the Vita and PS4 with the Vita TV. The Vita TV is a micro-console device that is aimed to provide the consumer with three main features. The largest and most hyped for feature is that the device is a fully functioning Vita without the front touch screen or rear touch pad. At half the cost you will be able to play over a hundred compatible Vita games on your TV using a DualShock 3 instead. On the PS4 side of things, the Vita TV will act as a streaming device. As it is a pain and tiresome task to move furniture and other equipment to unplug your console, the Vita TV will save you from moving the device to a different room and will wirelessly stream your PS4 to any other TV in your house. The Vita TV and PS4 streaming will use the exact same app that the Vita will use for its connectivity. The Vita TV will receive the signal as if the Vita would, but instead displaying the image on your television using an HDMI cable. It seems as if Netflix in on every device these days, and of course the Vita TV doesn't fail to deliver that. The Vita TV also functions as a cheap media hub, where your can use all sorts of media streaming services such as Netflix, Hulu, Niconico, and be able to access the PlayStation Store. With all of this in mind, it seems Sony is pushing the true all connected gaming experience. You almost never have to go anywhere without being able to play your games from home on the go. This all also gives an intensive to an all digital future. Without the ability to switch your disk in your console when your on the go, an all digital library will give you the ability to never have the need to switch out a disk, giving you access to all your titles instantly. It again seems like a way Sony is pushing the future of video gaming, more so in a connected direction using more than one device, rather than an all in one media center. It may be a hefty price to own all three of these devices, but like said before by many people, each additional device you own, will add to your PlayStaion Experience.